Termed simply as a brain attack and medically as a cerebrovascular mishap, a stroke is a medical condition in which depravation of oxygen is experienced by a portion of the brain. Such a condition can happen if damage is suffered by the artery responsible for supplying blood to the brain. The brain cells cannot live without oxygen and start dying immediately due to the lack of oxygen. The extent of the damage suffered during a stroke increases if the brain is deprived of oxygen for a long period of time. Paralysis is usually a result of stroke where the person loses his ability to use his limbs and starts having difficulty in walking. Cognitive impairment is another effect of stroke in which the person loses some of his memory and starts having difficulty in concentrating on things. Depression and loss of control over emotions are common problems faced by stroke patients if the front part of their brain gets damaged during the stroke. If the brain’s left hemisphere is damaged, then the patient would find it difficult to speak properly and might even have difficulty in reading and writing as well. Dysphagia is another effect of stroke which is associated with weakening of the facial muscles and can make it difficult for the patient to eat and swallow. Perception loss is also a common effect of stroke wherein the person loses his ability to judge distances and thus ends up getting into accidents. Face drooping. Gradual loss of feeling in the facial muscles. Arm weakness. Having difficulty in lifting arms up over shoulder. Speech difficulty. Having any sort of difficulty in speaking. Time to call 9-1-1. Any sign of the symptoms above, call 9-1-1. Frequent alcohol drinkers are more at risk of having a stroke than people who don’t drink. Cigarette smoking as well as exposure to it can lead to a stroke too. People who are under stress or constant depression are prime candidates of suffering from stroke. People having family history of stroke or heart attack are more likely to suffer from stroke than others. 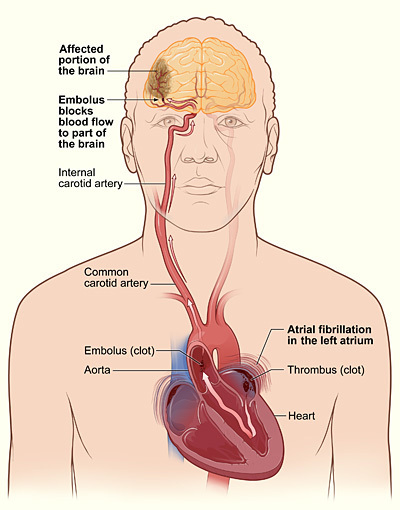 People having a high blood pressure (over 120/80 mmHg) are at greater risk of having a stroke. Overweight and obese people are far more likely to suffer from stroke than average weight people. Now that we have known what happens during a stroke and the damage a stroke can cause. We should spare no efforts to avoid a stroke from happening. Adopting a healthy lifestyle is among the key things that can be done for preventing the risk of having a stroke. Increase your consumption of vegetable and fruits. Include low-fat food items in your diet that have a low calorific value. Start making use of safflower, olive or canola oil instead of fat or usual oil. Start eating lean red meats and skinless turkey, fish and chicken. Stop eating fried foods and instead go for boiled, baked or broiled stuff. Dance more. Dancing is a good form of exercise which can keep the blood flowing through the body and reduce the chance of having a stroke. Walk more. Walking can greatly help in preventing stroke. Being the simplest form of exercise, walking can be done at any time you want. Exercise more. Participating in a sports activity, like swiming or riding a bicycle, can help in staying clear of stroke too by keeping your weight down and increasing blood flow to your brain. However, don’t start any exercise regime before consulting the opinion of your doctor. Limit alcohol intake. Keep your consumption of alcohol down to two pegs a day. The more alcohol you drink, the higher your cholesterol level will be which can cause a stroke. Thus, it is better to keep your drinking habit in check. Quit smoking. Smoking can cause severe harm to the cardiovascular system of the body. The harmful chemicals and gases found in cigarette smoke can narrow the blood vessels and cause abnormal blood clotting which can lead to a stroke. Thus, quitting this habit is important to steer clear of stroke.